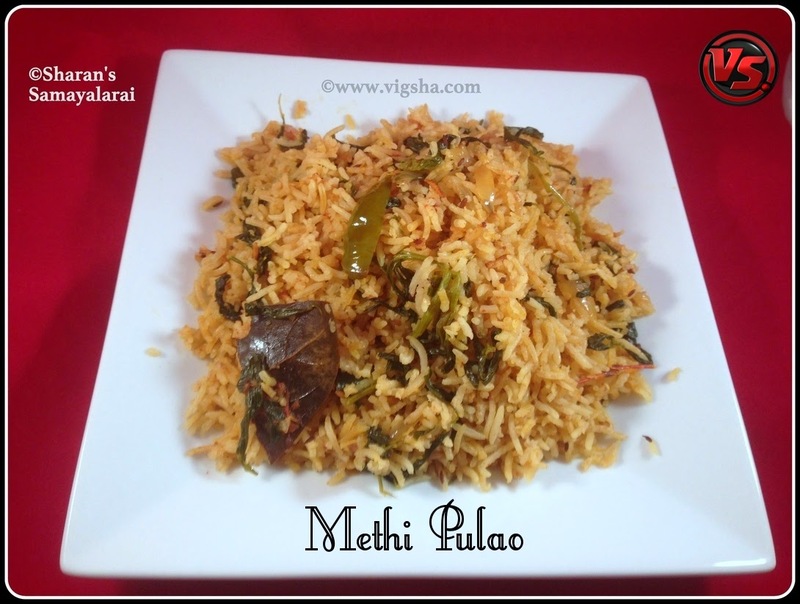 Methi Pulao is a simple, healthy one-pot meal recipe. Methi leaves are very rich in vitamins and minerals, they get easily absorbed into the body. Some major ingredients include calcium, potassium, phosphorus, iron and dietary fiber in its naturally occurring form as in other vegetables. The availability of vitamin K is as good as in spinach. The protein rich fenugreek leaves can be treated as a wonder herb. Though these leaves are bitter by default, it adds flavor to the pulao. My cousin Dhyanu, bought lots of greens from Pittsburg. One among them was a bunch of Methi leaves, so I experimented new recipes using that. To my surprise, these leaves stayed fresh for more than 20 days. I laid my hands on these leaves for the first time and it tasted flavorful. 1). Trim the roots of the methi leaves and pick the leaves discarding the stems. Immerse it in a bowl of water with salt so that all the dirt will settle at the bottom of the bowl, keep aside. 2). Wash and soak basmati rice for 20 minutes. Drain the water and keep aside. Heat ghee or butter in a pan and saute the rice for few minutes. 3). Heat oil in a pan, add cloves, cinnamon, bay leaf and saute till aromatic. Add sliced onions and saute till onions turns light brown. Then add green chillies along with tomatoes and saute till it becomes soft. 4). Now add chilli powder, coriander powder, turmeric powder, salt and saute for 2 minutes. Add the methi leaves and saute till the leaves are wilted and shrink in volume. 5). If using rice cooker, switch off and transfer the contents to the rice cooker. Then, add sauteed rice and enough water. Check for salt and adjust accordingly. If using pressure cooker continue the procedure and close the lid. Leave for a whistle or two. Once pressure releases, open and fluff it with a fork. Flavorful Pulao is ready.. Serve hot with raita! # Sauteing the rice in ghee is optional, it gives flavor to the Pulao. # You can make the pulao rich by using coconut milk instead of water and garnish with ghee fried cashews.